Arizona District 7 coordinates a Winter Baseball program. Emphasis is placed on Training and Development. Mandatory Play is 6 outs / 1 at bat per game MINIMUM. Please register your VIP card with FRYS to help support this program. 3) 2020 Playoff Dates: 1/20 to 1/25. 4) Practice’s are during the week after 530 (1 per week). 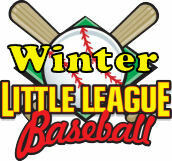 5) Winterball is open to players aged 7-14 (Baseball). 6) Space is limited and spots are on a first come first serve basis. 7) Players are grouped by area (their "home" league) – player requests are accepted. 8) Uniform includes Hat and Shirt. Fields, umpires, lights, etc, are all included in the cost. 9) Season is from November 25 through January 18 with playoff’s running into the following week. 10) Boundaries are combined during the Winter season. 12) Double headers may be played throughout the season. No practice 12-16 to 1-2. We do not do any type of winter season fundraising. Fee’s are due at registration. The fee’s paid cover equipment such as game balls, lights, field rentals, insurance, umpires, and of course the uniform. Fee’s will be refunded if a player is unable to participate but please notify us as soon as possible.